Since our very first visit to Portugal in 2003, we’ve had a deep and lasting love for Port wine. It’s almost impossible not to when seated cozily next to a fire with an rich and satisfying glass of Vintage port, or even beach side with a White port and tonic. Yet grasping its depth, diversity and complexity has been a challenge at best. Having an understanding of the different ports not only provides a greater appreciation of the stuff itself, but quickly demonstrates that port wine isn’t just the rich, sweet, dark red taste of Christmas, but that its different guises, whether white, pink, tawny or vintage, are worth enjoying much more frequently! Yet, how do you simply and effectively describe each of the styles in a way that a first time traveler to Portugal can quickly grasp? Enter stage left, Catavino’s Port Wine Infographic! 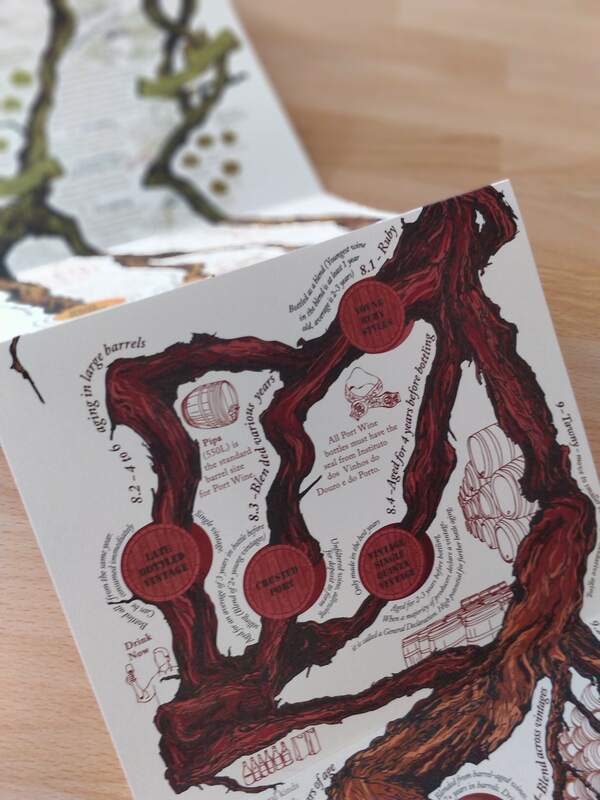 This infographic was our attempt to not only demystify Port wine, but to make it visually captivating and interactive. We wanted someone who was even mildly curious about wine to be enchanted by the illustrations and prompted to refer back to it over and over again, which is why we contacted José Miguel Cardoso. José Miguel is not only a dear friend, but an incredibly talented Portuguese artist, who has done several projects for us in the past, including The Port Lodge Map. His amazing attention to detail, elegant contours and finely drawn lines has made our maps and illustrations come to life! We couldn’t be more pleased to have collaborated with him on this project, and truly hope you fall in love with his drawings as much as we have. This infographic is currently on sale in our newly opened space, theLAB, located in the heart of Porto. If you’d like more information on how you can have a copy of your own, or about the infographic itself, please don’t hesitate to contact us!